Most of you reading this blog are Speech-Language Pathologists. So this should be an easy question right? The dictionary definition which is simple states, "A minimum or starting point used for comparisons." Sounds easy right? Let's talk about that word quantitative for a minute, defined as, "of, relating to, or involving the measurement of quantity or amount". Further explained as, "type of information that can be counted or expressed numerically." (examples: an exact count, or number). Okay, to summarize a baseline is a: starting point, current quantitative level/number, indicator of how much change to expect. Lately IEPs I have been receiving have baselines stated as such, "below age level in English and Spanish," or this one, "low intelligibility due to multiple misarticulations". Here lies the problem! With goals we want to know to what extent is the student below age level? What percentage of intelligibility? What kind of misarticulations? Without this quantitative information SLPS cannot know or state to what level of accuracy a student can actually achieve right now, how much we can expect them to improve within a time period, and what level of mastery to expect. How do we find this quantitative information? It's all about the way we evaluate and gather data and usually it's right in front of us, we just have to find it and write it the right way! Look at your assessment results, yes the student is low in both languages, but what specific areas or subtests. Once you have a specific area (i.e. morphology/syntax) you can break it down a step further. What did they number or % did they achieve? (i.e. 2/10 trials or 20% accuracy, with regular plurals in isolation, with picture cue) That's your baseline! If there is no starting number or percentage, how on earth will you determine how far they have grown!? TIP: I always try to write my baselines and goals by specific number of trials, across a number of set sessions (e.g. 8/10 trials across 3 speech sessions). Keeps it simple and with percentages, we don't really know how many times, unless we discuss it at the meeting with parent (e.g. Oh, Sally got 80% accuracy with WH questions. Oh well how many? 4/5? That's not very many. Across how many sessions? Was it one day? That's not very consistent.) . If the number of trials is already in the goal you have something concrete to shoot for. How do you write your baselines and goals? I would love to hear from you! 1. 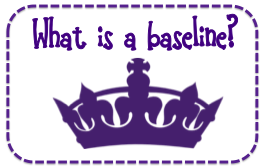 Can we use the same items in baseline assessment in actual treatment? Does that match the purpose of 'process tracking'? 2. As far as I know, only untrained items can be used in generalisation probing, but what about those used in baseline assessment before? Can they be used for probing again?